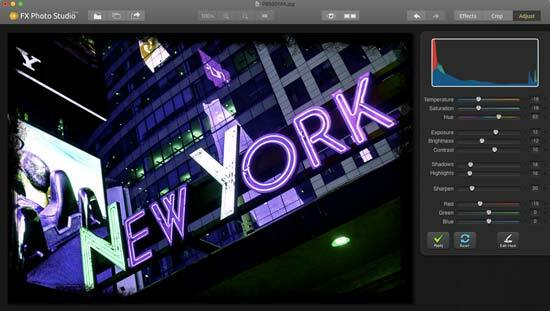 Part of MacPhun’s Creative Kit, FX Photo Studio is designed to allow you to apply filters and effects to your shots. 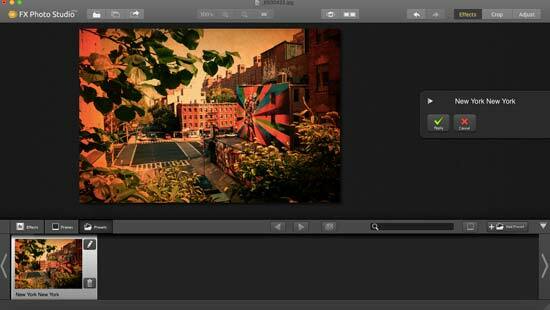 Like other MacPhun software, you can use it on its own, or as a plugin for Adobe Photoshop CC, Elements and Lightroom. You can buy FX Photo Studio on its own for £20, or part of the Creative Kit suite for £89.99, which features six different photo editing apps. 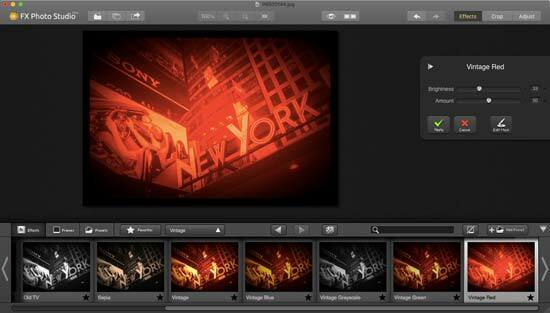 A starter’s edition is also available, which only includes Snapheal, FX Photo Studio and Intensify for £70. 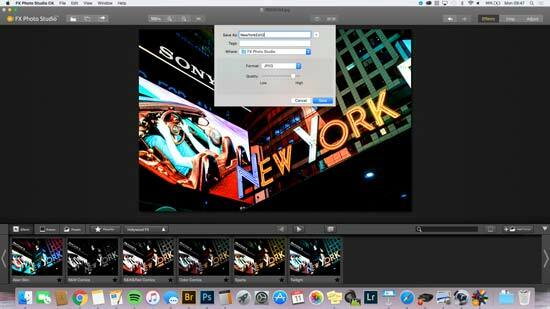 Installing FX Photo Studio is a very easy process, as is the rest of the MacPhun creative kit. 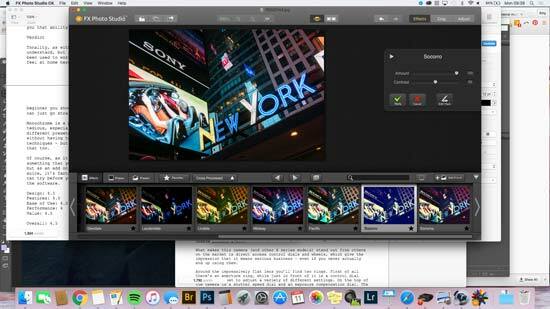 You can download the software directly from MacPhun’s website. As with other apps, there’s the option to download a free 15 day trial. This is a good way to start getting to grips with the software, but you need to bear in mind that you won’t enjoy the same full functionality as when you’ve downloaded the full version. Alternatively, you can download and pay for the full version, but if you’re not completely satisfied with how MacPhun FX Photo Studio runs you can get a full refund within 30 days. 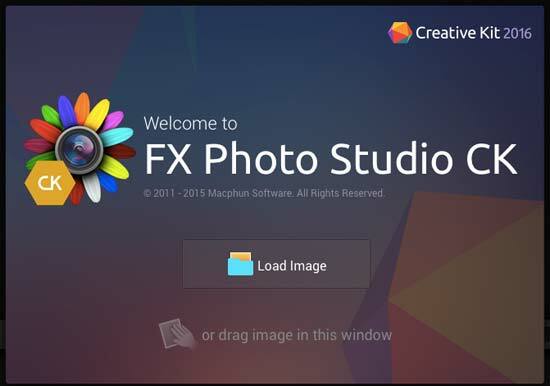 Once you’ve downloaded FX Photo Studio, just drag the software’s icon into your Applications folder to start the installation process. When you open the software for the first time (if you don’t have any other Creative Kit apps), you can choose to start your trial, or you can input the activation code if you have paid for the software. If you’ve paid and installed other apps from the Creative Kit already and it’s not the first app you install, you should bypass this step. Again, if it’s the first piece of software you’re installing from the Creative Kit you’ll be prompted to install the software as a plugin to any compatible software you already have on your machine - for example Adobe Photoshop CC, or Adobe Photoshop Elements. 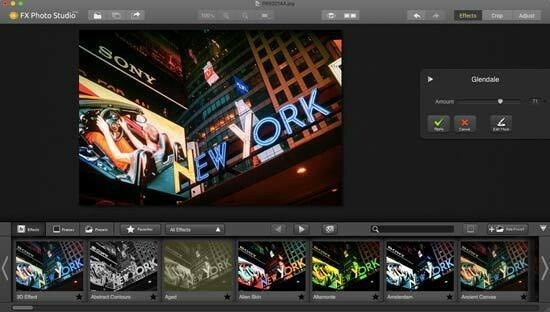 Just like many of the other MacPhun apps, FX Photo Studio has some powerful editing tools, but it has been designed to be as easy to use as possible. 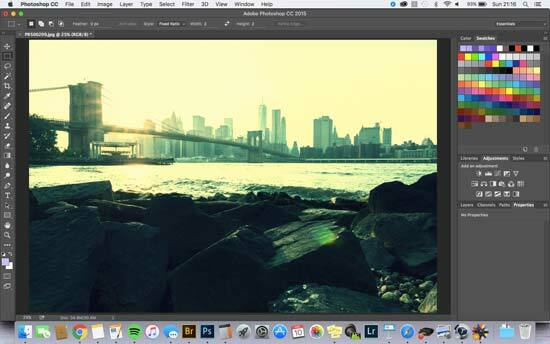 The first thing you need to do is choose the picture that you want to work with from your computer. You won’t be able to open more than one image at a time, unlike Photoshop, so keep this in mind. You can save projects as you go along if you want to swap between different images though. Once any photo is open, you’ll be able to open another one by clicking File > Open from the top menu. A list of recent photos that you have opened will also appear there to make it quick to find recent images. You can open raw format files if you prefer - most camera’s proprietary files are supported. After you’ve chosen a photo, you’ll see your photo, and a group of Effects presets which are ready to choose from along the bottom of the window. You can filter the different effects by type, or choose to show all of the effects at once. There’s groups such as “Cross Processed”, “Photo Styles”, “Vintage” and so on. Simply click on any of the presets and the style will be applied to the image straightaway, very quickly without waiting for the edit to be applied. Any of the effects can be added to your favourites by clicking on the small star icon which be found in the bottom right hand corner of any of the effects thumbnails. If you find a few you like, this is a good way of grouping them together without having to remember where they all are in the longer lists. To the right of the image you’ll see there is a dialogue box which allows you to adjust the level of the filter (from 0-100%) depending on how strong you want the effect to be. You’ll also be able to create an effect mask from this dialogue box. Click on “Edit Mask” and you’ll be taken to another dialogue box where you can erase parts of the filter if you only want to apply it to certain areas of the image. It’s a very simple process, you can change the size and style of the brush that you’re using to create the mask, and when you’re ready simply press “Done” to apply the mask. Next to the area of the panel that says Presets, you’ll see that it also says “Frames”. 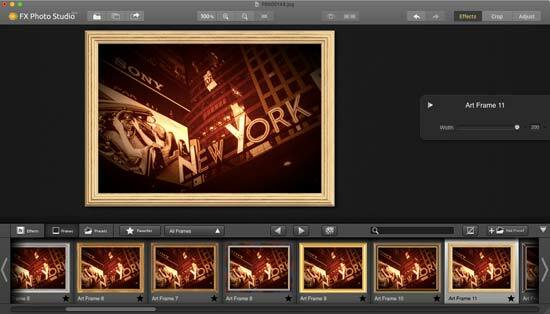 Here you’ll find a variety of frames which you can add to your image. Some are quite subtle and understated, while others are a little more garish. It’s worth experimenting with the different frames, and you can also adjust the width of each individual frame to suit your preference. Once you’ve added at least one effect to your image, you can save as a preset, meaning you can quickly come back to the desired effect whenever you want. You can add as many combinations of different filters to a photo as you like, saving as a preset once you hit upon a group that you like. You can make individual tweaks to each part of the filter, saving as you go along. As always, it’s worth experimenting with these to see if you can find a combination which you like. Along the top of the effects panel you’ll see a dice icon. This is a fun and interesting tool which will pick a random frame or effect for you - it’s a great way of testing out different effects and how they look without having to choose one yourself and you may find something you like quite by chance. Moving now to the top of the FX Photo Studio window, is that you can move between the Effects panel, a Crop Panel and an Adjust Panel. The crop panel is a simple way to quickly change the crop or rotation of your image, either at right angles, or by one degree at a time. Once again, when you’re happy with the crop, press the apply button. 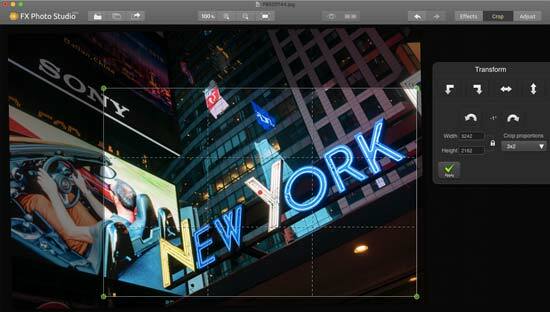 The Adjust panel will let you make some more extensive edits to your image. This includes the ability to change temperature, saturation, hue, exposure, brightness, contrast, shadows, highlights, sharpen and so on. 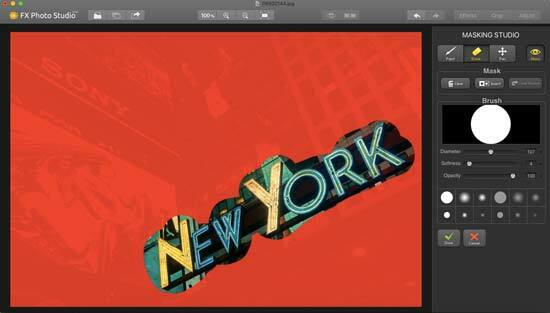 Like with effects, you can use an Edit Mask if you want to only adjust a certain area of the image. The adjustments can be made by moving sliders to the position you need to make the edit, and again, once you’ve made all the edits you want to make, you press apply to be taken back to the main effects window. There are a couple of other very useful tools found via shortcuts found on the top of the program window. First of all there’s an icon which looks like an eye. Hold this down and you can see how your image looks without the effect(s) applied - this is very handy for quickly checking how the effect looks in comparison with your start image. The second icon looks like two boxes next to each other - this will show two images side by side, or rather, more accurately, the same image side by side, one with the effect applied, and the other without so you can assess how the effect will look next to your original image. Just to the left of these icons is a group of icons which are used for zooming in and out of your image. There’s one for simply zooming in, another for simply zooming out, another to make the image fit the screen, and another to make it jump to 100% view. These are quick and handy to use and help when you’re trying to check fine detail of how an effect looks on your image. 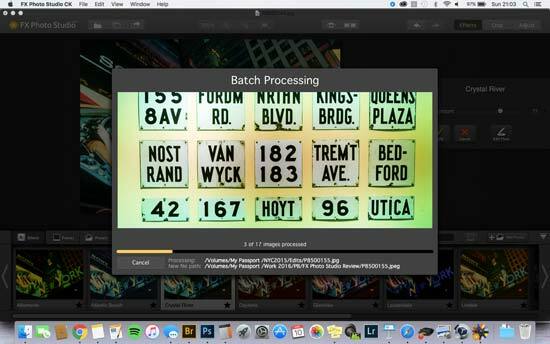 If you want to add the same kind of effect to lots of different images, there’s the option to perform a batch process. 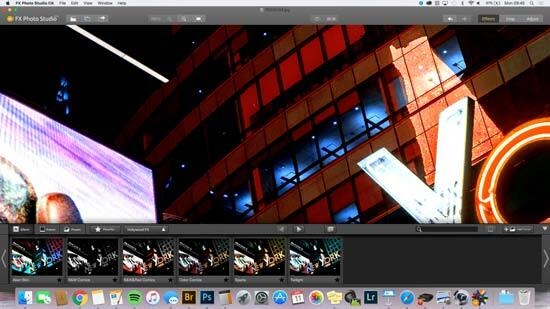 First you need to choose the effect (or preset) you want to add to the photos. Click on it in the bottom bar, but don’t click apply. 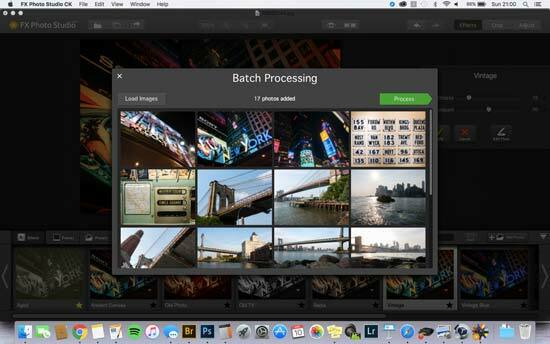 Next, click the batch process icon from the top of the workspace, and you can choose a number of images from a folder on your computer, or simply drag a set of images into the workspace. You'll then be able to choose what format to save the images in, what dimensions they should be, where to save them and what to call them. Once you’re ready press Process and the batch editing will begin. 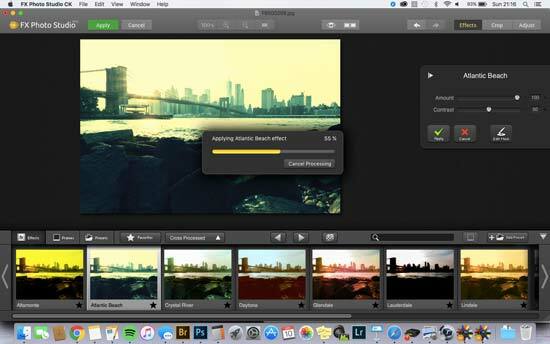 If you’re just editing a single shot, once you’ve finished, it’s time to export the image. Click File > Export to Image and then you can choose a file format (for example JPEG), give the file a name and choose which quality to save it in. Click Save and you’ll have the finished editing. If you’re not quite ready to export the photo but you want to close the program, you can click File > Save to save a project file (.mpt) - just as you might save a PSD in Photoshop. 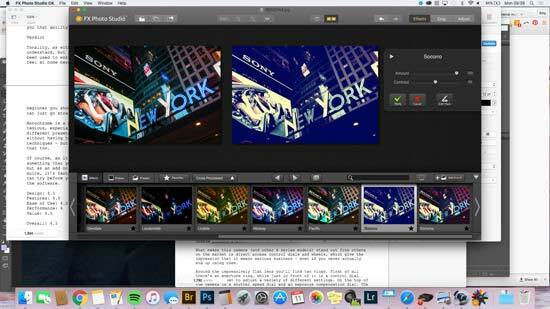 FX Photo Studio is also available as a plugin for Photoshop, and it’s very easy to use. We’ll use Photoshop CC as an example. 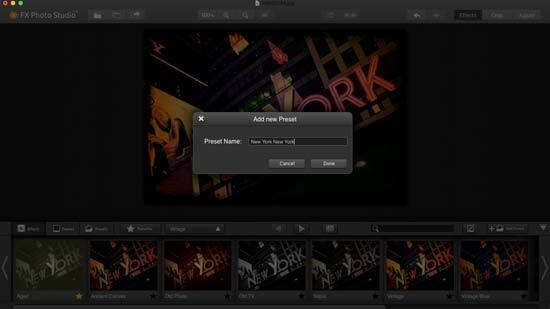 Open the file you want to work on first, then click Filter > MacPhun Software > FX Photo Studio. Once you’ve done that the Tonality window will open and you’ll be able to make any of the adjustments previously mentioned in this review. 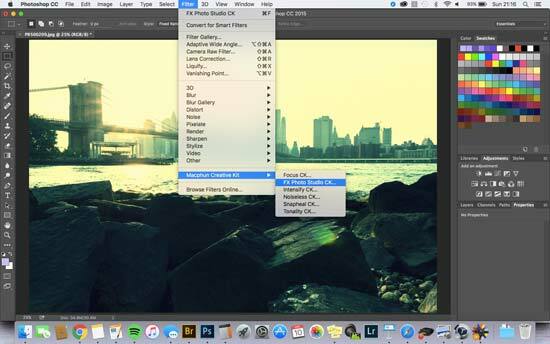 Make the edits you want, and then press Apply at the top of the screen and your image will re-open back in Photoshop with the effects applied. It’s another quick and swift process which makes this a fun and useful add on for existing software.